A questioning murmur, however, accompanied the plaudits: Why an inverted cross? Isn’t an upside down cross an insult, a negation of Christianity, even satanic in nature? Couldn’t the school have found a more appropriate symbol? The keys of St Peter perhaps? In choosing its symbol, St Peter’s College was well aware of the negative connotations of the Petrine Cross. In the end, however, the inverted cross is an ancient Christian symbol. It belongs to us — thank you very much — not to those in the last century or so who have chosen to abuse it in order to denigrate Christianity. In other words, St Peter’s saw no need to cower to an insulting culture. Quite the opposite: In choosing its symbol, and in the midst of a sometimes hostile culture, the college saw a need to proudly reclaim the Christian heritage. In the Gospel of John, Jesus portends Peter’s death: The first pope may have been free as a young man, but “when you are old, you will stretch out your hands, and another. . . will carry you where you do not want to go”. The outstretched arms foreshadow Peter’s crucifixion. The second century Church Fathers, Origin of Alexandria and Tertullian of Carthage, further attested to the tradition that Peter did not feel worthy to die as his master; in a most admirable display of humility, they wrote, the leader of the nascent Church asked to be crucified upside down. And so, from antiquity the inverted cross came to symbolise the humility of St Peter. Later artists will continue to depict the tradition — the most famous, of course, is the early 17th century Caravaggio which still hangs today in Santa Maria del Popolo in Rome. that needed emphasis today among our young, as it was the role model of strong, yet humble, Christian, Catholic leadership — even unto death. The Church today is living through a time of great uncertainty. More Christians have been martyred in the last 100 years than in the combined first 1900 years of her existence. And although it is true New Zealand enjoys relative peace and prosperity, the secularism of the West, of which the New Zealand society is very much a part, is a force not to be ignored. The goal of St Peter’s College, then, is to form next year’s Catholic leaders: capable, well-educated, articulate men who will boldly — yet humbly — lead the Church in these troubled times. The Petrine Cross symbolises that goal. So far, that cross planted at the entrance of the college seems to have borne fruit. People stop. They notice. Hopefully they think. It has become as much a symbol of student Christian formation as it is a tool for evangelising the outside world. 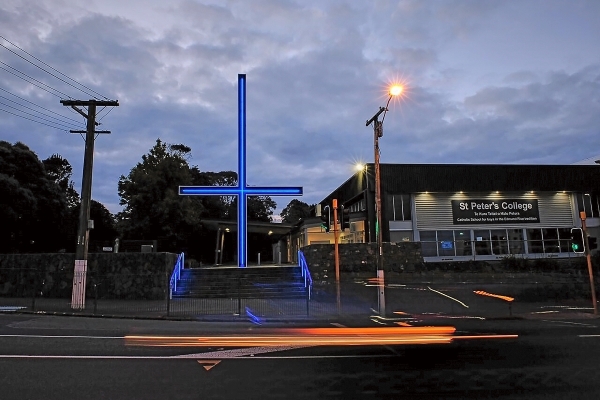 As for those who might wish to denigrate Christianity with the use of an upside down cross, let us be bold in challenging them to contemplate their actions in light of the far more ancient, the original Christian tradition as represented at the entrance to St Peter’s College. Let them slink in embarrassment when they learn their actions and symbols bespeak not insult, but humility before their Lord and our Lord Jesus Christ. Dr Dan Stollenwerk is head of faculty, theology and philosophy, St Peter’s College, Auckland.